The foreign ministers of breakaway regions of Abkhazia, South Ossetia and Transdniester are due to meet in Moscow on Tuesday to discuss how they can make the international community recognise them as countries in their own right. The three regions have long declared their independence from their mother countries. Nevertheless, their sovereignty remains unacknowledged by the international community. Last year the presidents of the three regions signed an agreement to create an organisation of unrecognized republics designed to promote their interests abroad. This is what is expected to be the focus of today’s meeting in Moscow. Transdniester declared itself independent in 1990, shortly after the disintegration of the Soviet Union. The international community still considers it part of Moldova, although de facto control comes from the capital Tiraspol. Its population is proud of its status, but strongly favours close ties with Russia. In a referendum last September, 97 % voted for independence and free association with the Russian Federation. South Ossetia has also held several votes attempting to reinforce its national sovereignty. The republic declared itself independent following a war with Georgia, which began in 1991. Georgia was forced to accept a ceasefire a year later, and a mixed peacekeeping force was established in the area. The region has held three referendums on independence- in 1992, 2001 and 2006. All three have been overwhelmingly in favour of separation, but have never been acknowledged by the international community, which defends Georgia's territorial integrity. The story in Abkhazia is similar. It broke away from Georgia in 1992, initiating another bloody conflict. The two nations were at war in 1993-1994 till Georgian forces withdrew from the region. The fighting saw the mass exile of much of the native Georgian population. 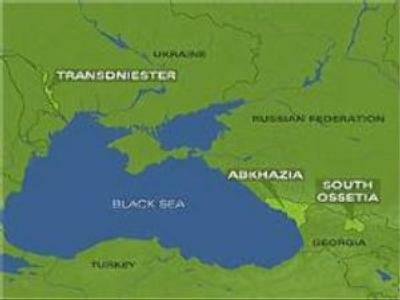 Russia backs Abkhazia's government based in Sukhumi, the republic’s capital. However, it has fallen short of openly recognising the country's independence, despite wide support in the Russian parliament, the State Duma.